In the seven years I’ve lived in New York City, this is by far the worst winter I have ever seen. The snow is relentless and is clearly overstaying its welcome. While stuck inside today I am sorting through spring plantings from past seasons. If you have spring fever like me, it’s never too early to treat your symptoms and begin planning your first seasonal planting of the year. Check out these ideas and tips to create a fresh look once warmer weather rolls around! 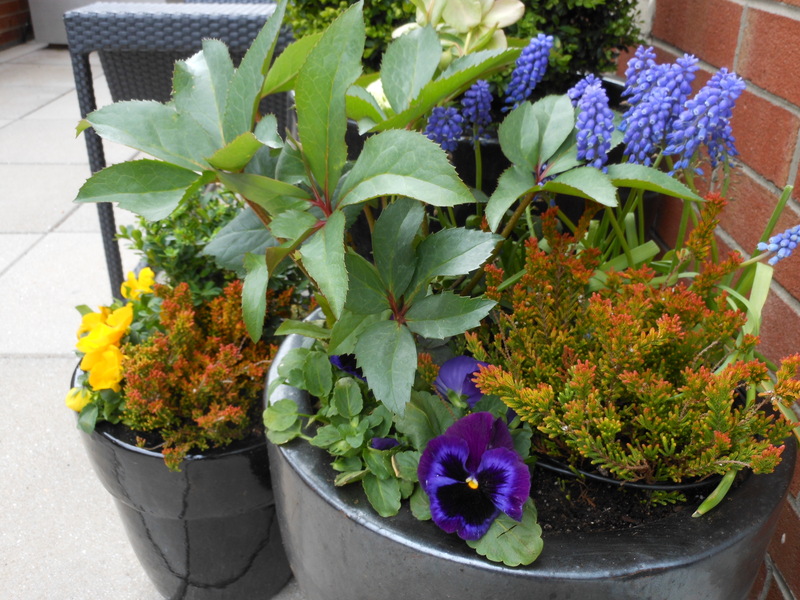 In spring, when deciduous trees and shrubs are just beginning to leaf out and the landscape is just waking up, a spring planting can add a ton of visual interest. 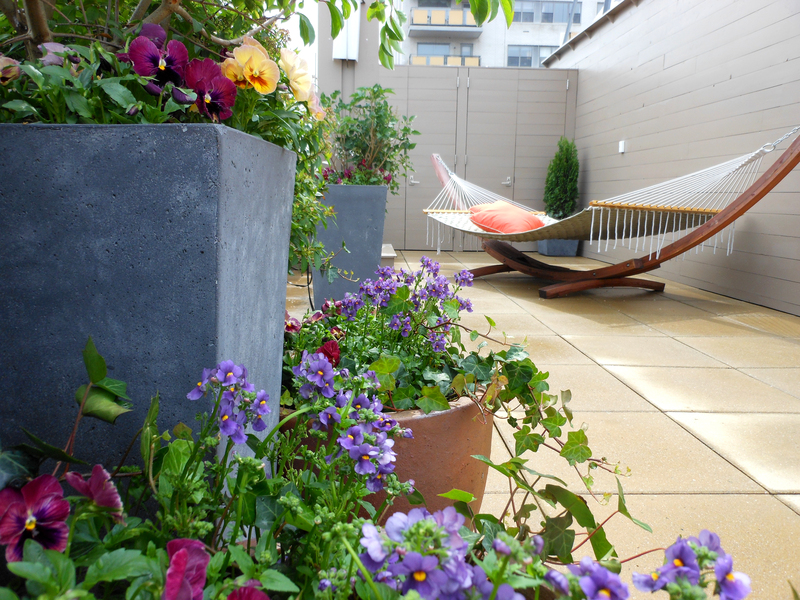 Use plantings of different heights, or in planters of different heights to draw your eye through the landscape. Your eye will follow the spots of color and if repeated throughout a garden, the color will create movement in an otherwise dull space. 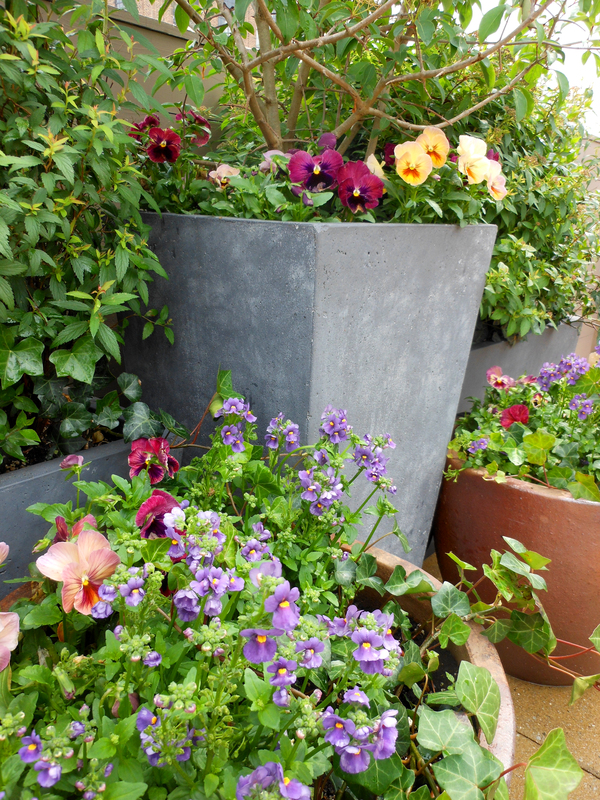 If in doubt, keep your planting simple. 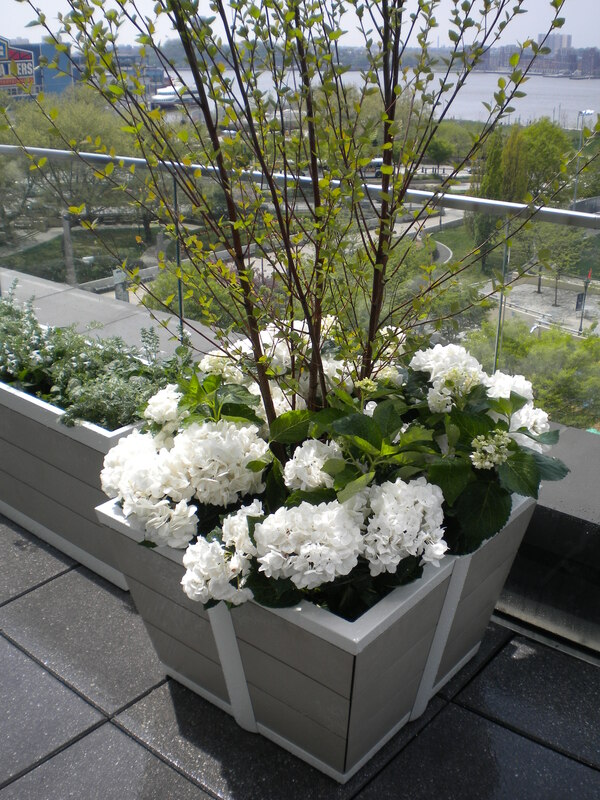 White Hydrangeas create a very clean and soothing look for spring. However, it’s my job as a landscape designer to create unique planting combinations. 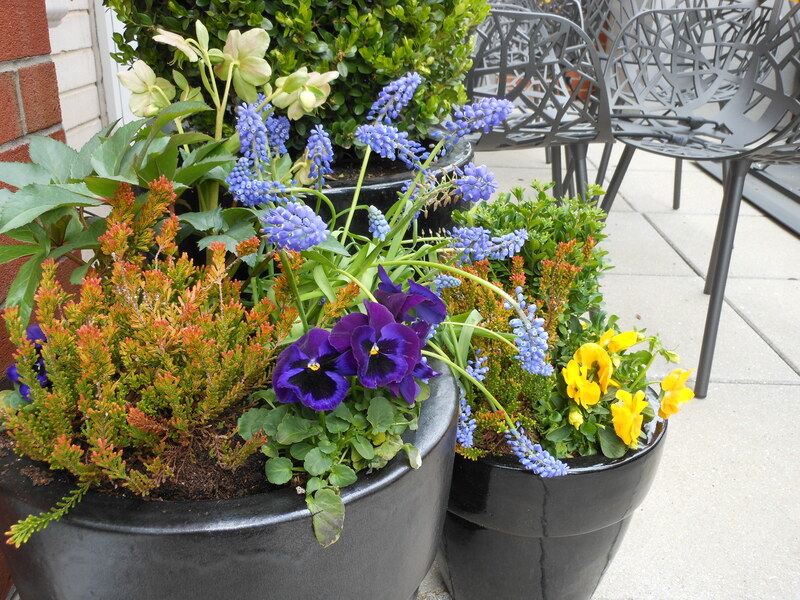 Don’t be afraid to use perennials in a planter for a seasonal planting. You can always replant the perennials into a planting bed once the display is changed out. Columbine (Aquilegia), Caladiums and Alyssum were combined to create a muted look for this late spring/early summer transitional planting. 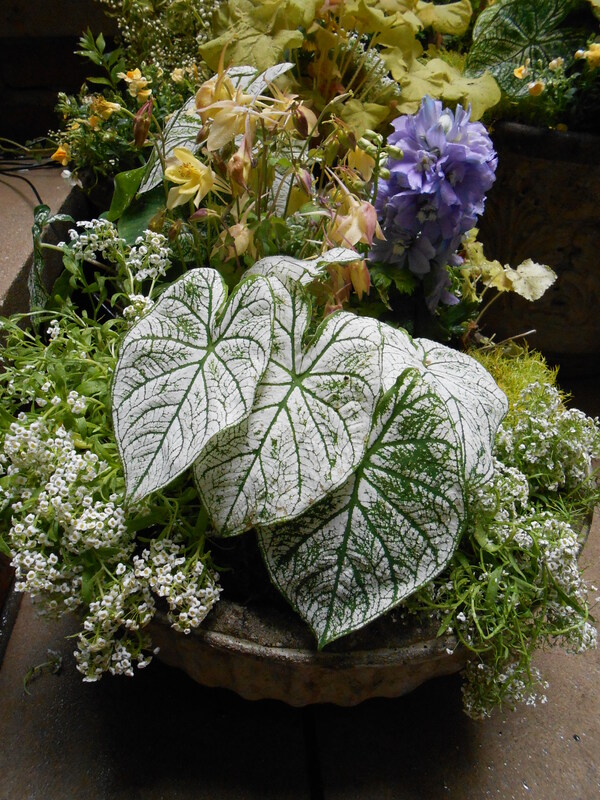 The texture of the broad heart-shaped Caladium leaves against the tiny white flowing flowers of the Alyssum is divine. I hope some of these pictures help you look past the current blizzard and start dreaming of spring. There is no better cure for spring fever than planning your garden and picking out plants that inspire you! The heat wave makes summer official. Don’t forget to add lighting so you can enjoy your garden at night. I took this shot from one of our recently installed gardens here in midtown Manhattan with a gorgeous view of Worldwide Plaza. Simple uplights highlight the branching of the newly planted trees while wall-mounted fixtures wash over the lounge furniture and create a soft pool of light on the lawn.